SEMI is the global industry association serving the manufacturing supply chain for the micro- and nano-electronics industries. SEMI promotes the development of the global electronics supply chain and positively influences the growth and prosperity of its members. SEMI advances the mutual business interests of its membership and promotes a free and open global marketplace. SEMI is a worldwide industry association that seeks to advance the interests of the global electronics supply chain. To stay on top of issues and initiatives supporting its 2,000 member companies, SEMI was using several PR service providers to accomplish it's daily tasks, but found that the quality of the team's work suffered. SEMI’s marketing team needed to streamline its processes for maximum efficiency and to ensure its message was reaching the right audience. They chose to consolidate their services within the Cision Communications Cloud. Mike Hall, Marketing Communications Manager for SEMI, believes that high efficiency driven by a strong process is key to managing a heavy workload. In his case, this ranges from weekly newsletters and press communications to social media and special projects. SEMI was using three different software providers for its communications needs: Meltwater, Cision and Trendkite. Hall decided to switch back to Cision, choosing the Communications Cloud® platform to reach relevant media influencers and craft compelling campaigns that impact customer behavior. SEMI's subscription includes access to Cision's North American influencer database and email distribution. 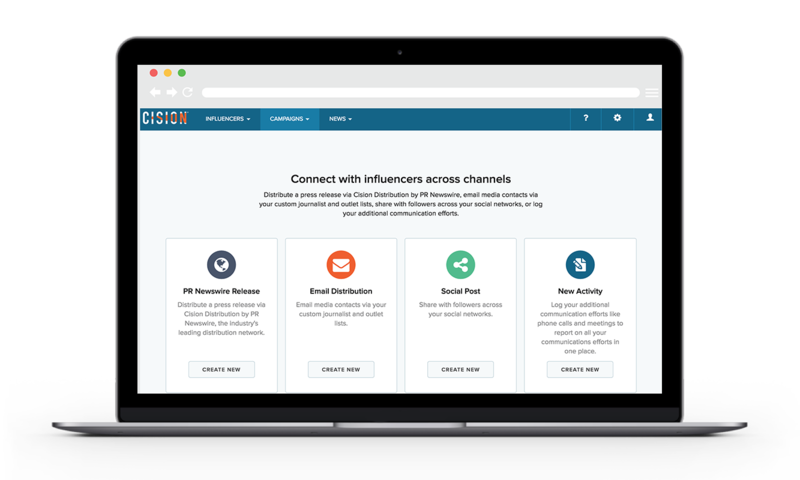 Cision's database provides instant access to nearly one million complete, dynamic and vetted influencer profiles. With this solution, SEMI can stay up-to-date on both established professional journalists and their outlets, as well as new media influencers, taking the guesswork out of finding the right contacts for its PR campaigns. Cision Database is integrated with an online news and Twitter archive, enabling users to search for recent content created by influencers. After building targeted lists, Hall enlists Cision's Email Distribution tool to easily build a multimedia-rich template for press releases distribution. “I’m sure the Meltwater email distribution platform is just what many of its customers need, but we found Cision much easier to use,” he said. Formatting Flexibility: Small details can go a long way in terms of efficiency. “In Cision Comms Cloud, you can upload your document directly into the platform, which makes it very easy to format it the way you want very quickly,” says Hall. Additionally, SEMI likes to include multimedia assets with its press releases. Manipulating images within Cision Comms Cloud has been very easy for SEMI; a task it found difficult with the other platform. “We need to add images in a snap since we include them in all of our communications,” says Hall. 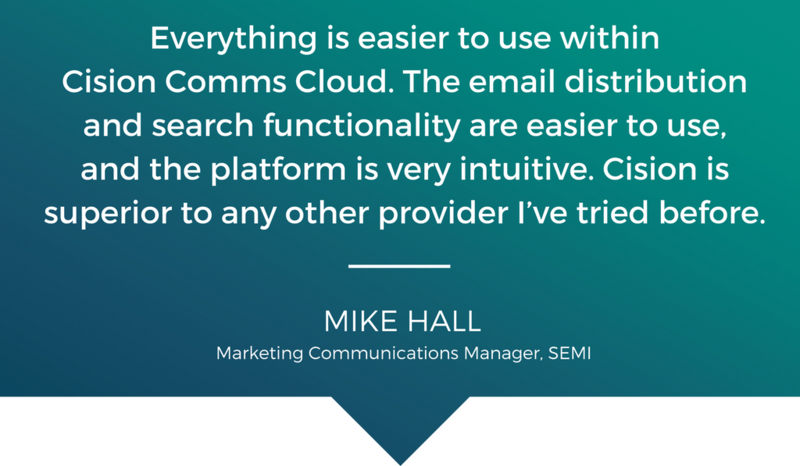 “For us, the work efficiency enabled by Cision Comms Cloud is vitally important.” Overall Ease of Use: From onboarding to building media lists, ease of use and an intuitive platform is key for SEMI. Most of SEMI’s PR campaigns are centered around events. They often have several announcements when promoting a single event. For example, SEMI will announce when registration opens, once the event takes place and sometimes also send press releases announcing speakers. In addition to events, SEMI develops in-depth research about the global microelectronics industry. For both needs, SEMI uses pre-built email lists aligned with specific announcements and they also take advantage of building new targeted lists within Cision Comms Cloud. This coming year, SEMI is looking to bring even more of its business to Cision. “Consolidating everything with Cision wasn’t possible this year,” says Hall. 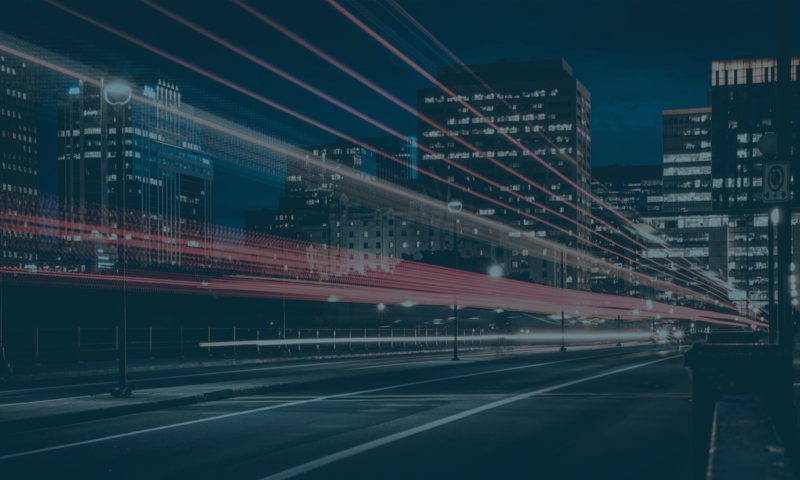 “When the time comes to renew, we’ll give strong consideration to bringing over the remaining aspects of our communications into Communications Cloud." This means SEMI's email distribution, press database, monitoring, analytics and wire distribution will be in the same place.